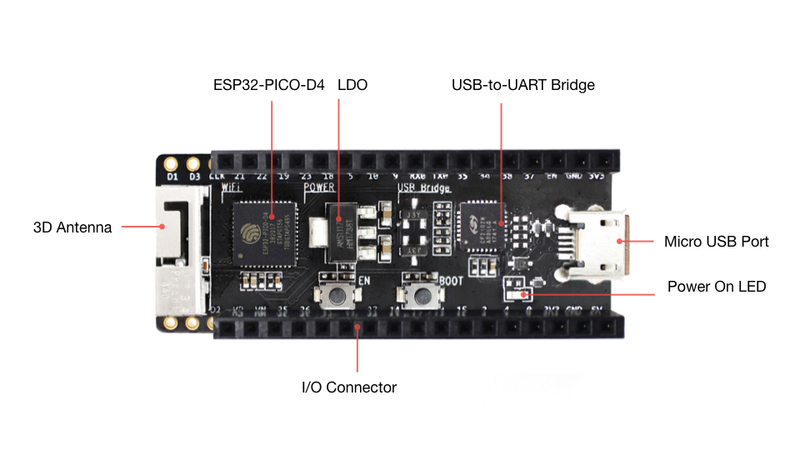 This guide shows how to get started with the ESP32-PICO-KIT V4 / V4.1 mini development board. For the description of other ESP32-PICO-KIT versions, please check ESP32 Hardware Reference. This particular description covers ESP32-PICO-KIT V4 and V4.1. The difference is the upgraded USB-UART bridge from CP2102 in V4 with up to 1 Mbps transfer rates to CP2102N in V4.1 with up to 3 Mbps transfer rates. ESP32-PICO-KIT is an ESP32-based mini development board produced by Espressif. This setup reduces the costs of additional external components as well as the cost of assembly and testing and also increases the overall usability of the product. The development board features a USB-UART Bridge circuit which allows developers to connect the board to a computer’s USB port for flashing and debugging. All the IO signals and system power on ESP32-PICO-D4 are led out to two rows of 20 x 0.1” header pads on both sides of the development board for easy access. For compatibility with Dupont wires, 2 x 17 header pads are populated with two rows of male pin headers. The remaining 2 x 3 header pads beside the antenna are not populated. These pads may be populated later by the user if required. The 2 x 3 pads not populated with pin headers are connected to the flash memory embedded in the ESP32-PICO-D4 SiP module. For more details see module’s datasheet in Related Documents. ESP32-PICO-KIT comes with male headers by default. 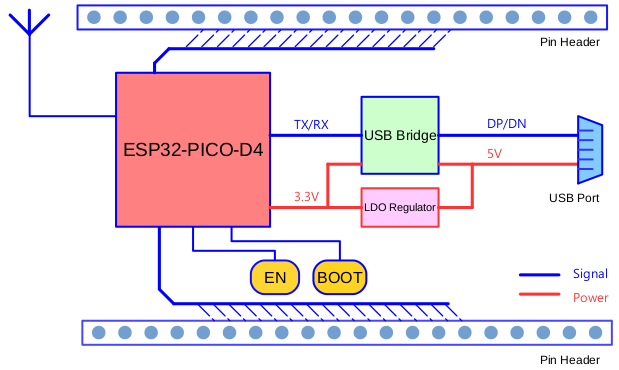 The block diagram below shows the main components of ESP32-PICO-KIT and their interconnections. The following figure and the table below describe the key components, interfaces, and controls of the ESP32-PICO-KIT board. ESP32-PICO-D4 Standard ESP32-PICO-D4 module soldered to the ESP32-PICO-KIT board. The complete ESP32 system on a chip (ESP32 SoC) has been integrated into the SiP module, requiring only an external antenna with LC matching network, decoupling capacitors, and a pull-up resistor for EN signals to function properly. USB-UART bridge Single-chip USB-UART bridge: CP2102 in V4 provides up to 1 Mbps transfer rates and CP2102N in V4.1 offers up to 3 Mbps transfers rates. 5V Power On LED This red LED turns on when power is supplied to the board. For details, see the schematics in Related Documents. I/O All the pins on ESP32-PICO-D4 are broken out to pin headers. You can program ESP32 to enable multiple functions, such as PWM, ADC, DAC, I2C, I2S, SPI, etc. For details, please see Section Pin Descriptions. The two tables below provide the Name and Function of I/O header pins on both sides of the board, see ESP32-PICO-KIT board layout. The pin numbering and header names are the same as in the schematic given in Related Documents. The following notes give more information about the items in the tables above. The operating voltage of ESP32-PICO-KIT’s embedded SPI flash is 3.3V. Therefore, the strapping pin MTDI should hold bit zero during the module power-on reset. If connected, please make sure that this pin is not held up on reset. Before powering up your ESP32-PICO-KIT, please make sure that the board is in good condition with no obvious signs of damage. The dimensions are 52 x 20.3 x 10 mm (2.1” x 0.8” x 0.4”). For the board physical construction details, please refer to its Reference Design listed below.